Siberian Ginseng (Eleutherococcus senticosus) belongs to a different botanical family than American and Korean Ginseng. Its properties, however, are similar. Ginseng works primarily to strengthen the adrenal glands, benefiting the pituitary. This property helps enhance immune function, making it a non-toxic preventative as it strengthens body's defense mechanism. This herb helps to normalize both blood pressure and blood sugar levels, making it useful for diabetes and circulatory problems. This helps correct reduced energy levels. 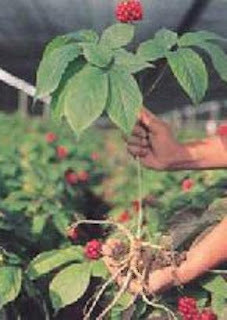 Ginseng is used by athletes for overall body strengthening. Its properties enhance both mental and physical health by building resistance to all kinds of stress. Because of its impact on adrenals and the blood, Ginseng helps to strengthen reproductive glands. In both men and women, this herb helps balance hormones. In men, it has been known to help alleviate and prevent impotency. It can help correct infertility problems in both sexes related to hormonal issues. In a laboratory study, Ginseng is reported to have enhanced breast cancer cell suppression in combination with standard treatment. As a treatment for bronchitis, Ginseng helps promote lung function. It can also be used as an appetite stimulant. With its ability to balance and support the body’s systems while assisting the removal of toxins, Ginseng has been used to ease withdrawal from cocaine, to protect against the effects of radiation exposure, and may help improve drug or alcohol-induced liver dysfunction in older adults. Ginseng used in combination with Gota Kola and Cayenne is considered a pick-me-up. People with hypoglycemia, high blood pressure, heart disorders, asthma, or insomnia should consult a physician before use and check for interactions with prescription medications. Ginseng is not recommended for pregnant women or nursing mothers.